Ten years of service gives a brewer some level of influence on the beers a brewery produces. For Bootleg head brewer Ryan “Pizey” Nilsson-Linne, the opportunity to celebrate his own decade long tenure meant only one beer would suffice: a massive double IPA. As he noted in a Crafty Pint article marking the milestone: “No sense in making a 9 percent beer for the occasion”. 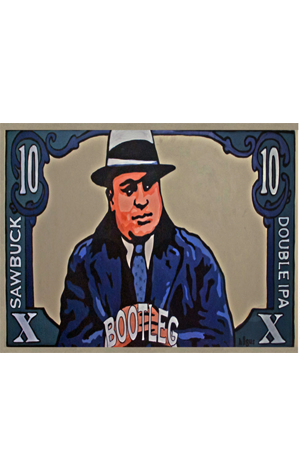 Indeed, the name, Sawbuck – in true Bootleg style – is Prohibition slang for a $10 note, just to make the point clear. Congratulations aside, there is beer to be drunk and Sawbuck is a fine release. Pouring a golden marmalade colour, the citrus and tropical fruit aromas, notably pineapple, flow through tasting before being joined by a piney and spicy character that's the result of a generous Chinook addition in the whirlpool and subsequent dry hopping. At 10 percent ABV, this is boozy and on the sweet side but remains in balance, much like the celebrations surrounding the anniversary. Congratulations, Pizey! Available in bottles and on tap from the Margaret River brewpub and select WA venues and retailers.